Portrait of Mark Reay, a New York Fashion photographer who is homeless. Living on a roof and out of lockers Reay goes about his business never letting on that he has no conventional home. This film was a big to do at DOC NYC last year. It was one of the films that many people who were covering the festival was talking about. It was also one of the films that people were talking about in the public screenings. Everyone seemed to be either talking it up or had heard about how good it was. I didn't manage to get to see the film back in November and I had to wait for this week's theatrical release. 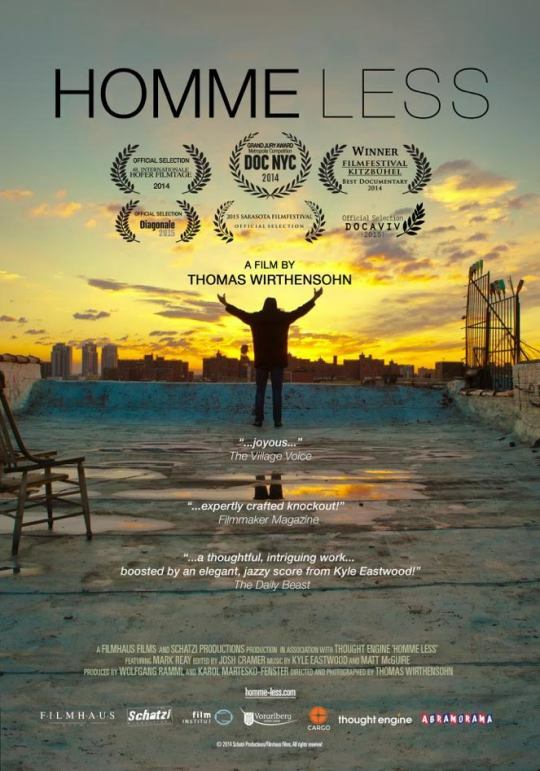 For me this is a very good film about what it takes to live in New York. If you've never been here you have no idea what it actually costs to live here, not only financially but also psychically. Yes Mark can't afford the sky high rents, but in order to stay here he has to maintain an appearance of being a big man on campus- a pair of his shoes cost over 200 bucks alone. Its a troubling portrait of what it takes to get by these days, especially in a city that I love so much. If there is any flaw in the film it's that, at least in the version I saw, there was no effort to bring things up to date. I know that at DOC NYC there was talk that Mark was no longer on the roof and that the situation had changed. I don't remember what the deal was and the promotional material I had been given didn't say anything. Revervations about what happened since the film was finished aside. This is a good film thats worth your time when it hits theaters Friday.